"Calling noise a nuisance is like calling smog an inconvenience. Noise must be considered a hazard to the health of people everywhere." 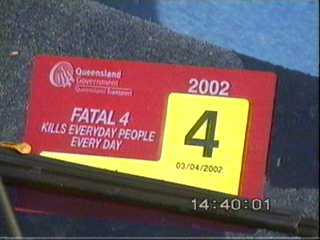 Brisbane Extra (Channel 9) covered the issue on 16 Nov 2001. 1. 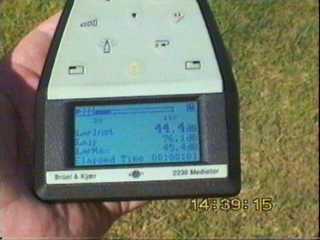 Background reading near car 44.4 dB. 2. Peak noise level 2-3 m in front side of car 91.6 dB. 3. Note time and the noise continued past. 4. Front of car. 5. 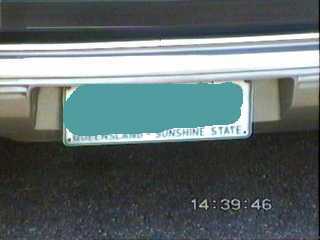 Rear rego plate. 6. Rego Label. The Queensland Government has no legislation to control car alarm noise - volume or duration. 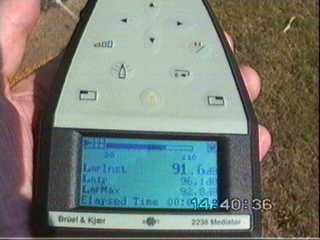 A parked car had its alarm running from about 12.45 pm until 3.58 pm on 7 Nov 2001 without a break and no action was able to be taken by any of the authorities against the owner. Press HERE to see noise meter results printout. The Queensland Police are the ONLY authority to make your complain to but there is no action they can take or so they say. That legislation needs to be enacted NOW to limit car alarms to a 10 minute maximum alarm without any automatic reset facility being allowed. That a reasonable penalty be provided so that car owners who allow their car alarm to continue to run in excess of ten minutes are forced to remove their alarm until it can be made comply. That no more than six months be allowed for compliance after legislation is enacted. 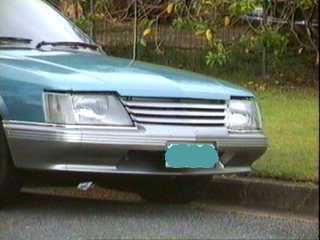 That Queensland Police officers be empowered to have a vehicle in contravention of such legislation towed to a suitable site where the continuing alarm does not impact on residents. That the car owner be responsible for any such towing cost which should be a pre determined amount and not at the discretion of the towing company. 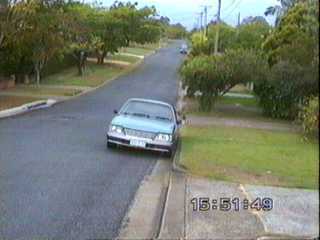 The car which appears in the photos above alarm started about 12.45 pm on Wednesday 7 November 2001. The police eventually arrived after 4.00 PM just as the sister of the owner was turning the car alarm off. The police communication room at about 1.12 PM said that they were not the appropriate authority to complain to. Then a further phone call o the Pollution hotline of the EPA confirmed that the police were the authority. A second call to the police accepted my complaint. This call was logged at 1.27 pm on the Police communication's computer in Brisbane Headquarters. Further two calls to the police was unsuccessful in finding out about any action police officers could take, if and when they did arrive and experience the car alarm noise. When it was obvious that no action was likely to be taken I began to collect evidence, video of the car with sound recording and to start a noise monitoring exercise with our Group's Noise Meter. Therefore the noise reading were only collected after it was obvious that the authorities could do little stop the noise. The EPA noise suggested Transport legislation could be invoked but Police say no! Eventually a call to the Transport Minister's office did not bring any comfort at all. A call to the Queensland Transport Vehicle testing Centre was successful in having an officer contact the owner's sister which eventually ended in the car alarm being turned off over three hours after it started.